Karen Keyworth cared deeply about Islamic schools and Muslim educators. She devoted much of her time and energy to the growth and development of our schools, leaders, and teachers. The seeds for ISLA as an organization arose out of this very concern. And while Karen is no longer with us, her legacy lives on. 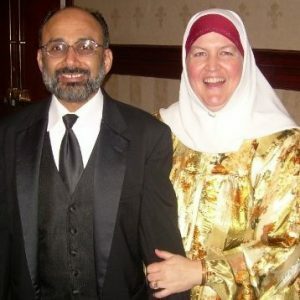 Leave a testimonial to help commemorate Karen’s great impact on Islamic schools in North America. Sister Karen was both a friend and a confidant since 1994. Her zest as a life-long learner was infectious! During the days that ISLA was being formed, we often discussed the state of Islamic schools in North America in a national and global context. Karen’s views were vast because they were based on salient research, along with personal experience as a parent, teacher, and administrator. She was a great listener, so this enabled her to process the experiences of others. All combined she envisioned the framework for ISLA. From that point, she unselfishly put in many hours to collaborate with others throughout the USA and the world to develop an organization that we hope will be a testament for her when she goes before Allah on the Day of Accounting, beithnillah. She will be missed but not forgotten. May Allah reward Karen for her untiring efforts on behalf of Islamic education even during the most difficult of times and through all the challenges she had to go through and they were many, her health being only one of them. We are all indebted to sister Karen and her determination in how far we have come with Islamic education thanks in no small measure to her. I still remember the joy on her face when we honored her at the ISNA Education Forum with her family surrounding her. I felt that she had everything and everyone she loved around her in one place maybe for the first and only time ever. Her face was beaming with happiness and an amazing smile that told the whole story. That will always be the image I have in my head of my dearest sister Karen and that is always how I will remember her. Till we meet her in heaven InshaAllah. To Allah we belong and to Him we all return. May Allah grant her forgiveness and the highest place in Jannah for her pioneering and tireless work on behalf of the education of Muslims, both students and educators. Her dedication and professionalism stood out to me–any time I contacted her she responded quickly and thoroughly, demonstrating a passion for this work for the sake of Allah SWT. And her smile and cheerful nature was so uplifting to all who met her in person. May Allah ease the sorrow of her family and close friends. Karen was a visionary. She foresaw the need for the growing number of Islamic schools to connect and share resources and experience. Whenever I think of Karen, it is her heartfelt genuineness that I remember. Karen was a supporter of Islamic schools and school leaders. Her research and the IECN are magnificent sources that she produced to promote and support Islamic education and Islamic schools. These will continue to serve educators, insha Allah. She leaves behind teachers and principals who have benefited from her insight and wisdom. She was a kind soul who was firm in her Islamic belief. There were no problems too big for Karen to handle, a testament to her faith. Educators presented their problems frequently and she made a great effort to find solutions for them. She was supportive and encouraging and we will miss that. I will miss her presence at the Ed Forum and her light and serious comments via conference calls at board meeting. And definitely, I will miss her sharp and precise edits of anything that was to be published in ISLA’s name. Whether it was retreat descriptions or ISLA advertisements, she was sharp with a critical eye for detail. Most of all she was a friend with whom I could share my thoughts and concerns. As any good Muslim, she would offer advice base on Qur’an and Sunnah and make du’a for me. Although we live on opposite ends of the United States and I saw her only occasionally, her presence will be missed as if I saw her every day. For me, Karen’s name came to be synonymous with ‘HELP’ for Islamic schools. Her contributions even reached the Eastern most part of the United States where our school is located in the US Virgin Islands. Oh ya Allah, one of your kindest servants is returned to you and we beseech you to shower her with your mercy and kindness, Ameen! I was finding myself noticing that Karen was not at the table during our banquets at the ISNA Ed Forum. For years we had unspoken plans to show up at meals and sit in groups to catch up with one another. I missed Karen’s ideas throughout the Forum. I recall many of her mannerisms and patterns of thinking. This year, 2017 I had the pleasure of sitting with her daughters at one of the dinners. I was pleased with the Tribute that ISNA Ed Forum paid to Karen’s efforts toward Islamic Education. She was a pioneer and a role model for building and for perseverance. I know words really don’t do her contribution justice, but I value her long friendship and professional collegiality. May Allah (S) grant her the highest station of the garden. Ameen. Sr.Karen will always be remembered as one of the pioneers of Islamic education in the U.S. Her passion, and love for children and promoting Islamic education has made a significant difference in the lives of many! Her legacy will continue with time and we will cherish her find memories in sha Allah!